Arthur's music is an unique, recognizable, timeless and catching mix between rhythm 'n blues, rock 'n roll, country-blues - in a jazzy sauce. With Ray Charles he shares his soul, with Tom Waits his rawness and with Eddie Cochran his rock 'n roll. Ebeling-originals are very own, recognizable, varied and just lovely - they sound like you've known them for years. In his song worldly wisdom and romance clash, heartache and and humor meet. His wry lyrics give way to an unconventional vision of life. Arthur plays solo as well as with one or more members of his band. Solo, playing the guitar like nobody does, becoming one with his Gretsch, and stamping his foot, he sounds like a whole band. With double bass, saxophone and percussion, the Arthur Ebeling Band is out of this world (too). Arthur Ebeling may be from Holland, but if you didn't know, you might think that he had come all the way from New Orleans. 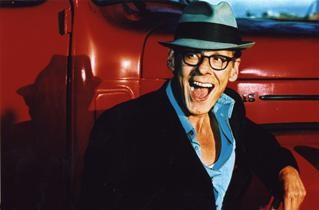 Arthur Ebeling starred in the 1996 tour 'Gretsch on the Road'. He plays in Holland, Europe and the rest of the world. He has toured succesfully in England, the USA, Russia, Brazil, France and Belgium and most recently in Spain. HE has opened shows for artists like Taj Mahal, Buddy Guy, Ann Peebles and Joan Armatrading.